Your TouchPoint database will come with a sample Week at a Glance report. However, you will want to configure it to meet the needs of your church. This is done using Programs and Divisions, where the Program specifies a “box” in the report and the Division specifies a line in the box. On the report, you can drill down to the Meetings Report page for any of the totals, then drill down further to specific Meetings, and even to the Attendees for that meeting. Week at a Glance and Average Week at a Glance for a sample report. The set up begins on the Programs page. Go to Administration > Organizations > Programs . Every Program that has a number in the RptGroup (Report Group) column will be included in the Week at a Glance. The number determines the position on the report (that’s the sort order). Each Program has a specified start time and end time for the meetings that are to be included. 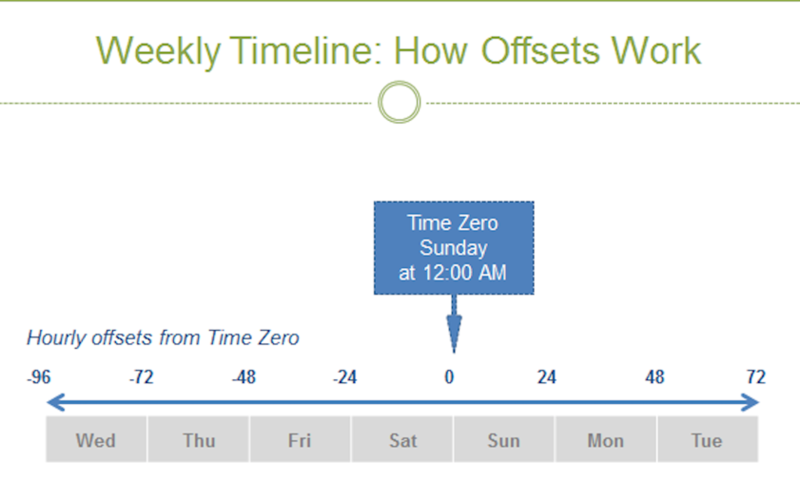 The time is specified as an offset from Sunday at 12:00 AM (midnight). If your groups have the same schedule, that is, they all meet at one hour, you do not need to include the time in the Report Group. However, if you have more than 1 hour and want to display multiple columns you have 2 options. The first numbers in the examples are the RptLines and everything in the parentheses and/or brackets are the columns/meeting times. Option 2 is specifying that the header 9:20 AM includes meetings with both a 9:20 AM Schedule as well those with a 9:30 AM Schedule. What you want to appear as the header is after the = sign. Either one of the configurations will work. Just remember: if you want multiple meeting times to display under a single header, use Option 2. The rows (or separate lines) in each part of the Week at a Glance, represent a separate Division. Every Division within a Program that has a RptLine will specify a line in the box. The Report Line determines the order in which the Divisions will display on the report. To configure the order of the rows, go to Administration > Organizations > Divisions . Filter for the correct Program, and then enter a number beside each Division that you want included on the report. These also indicate the order in which they will appear on the report. The image below indicates that within the Life Groups Program (a section on the report), Children will report first, then Older Students, and so on. You can configure the report even if you have only one Program. That Program will be the main ‘box’ in the report, and any Divisions will be the ‘rows’. If you are not familiar with Programs, Divisions, and Organizations, you will want to take a look at some help articles about these.